BEIJING, Oct. 29 (Xinhua) -- Xi Jinping, general secretary of the Communist Party of China (CPC) Central Committee, on Monday called for mobilizing the country's hundreds of millions of workers to make accomplishments in the new era and break new ground in the cause of the workers' movement and trade unions' work. 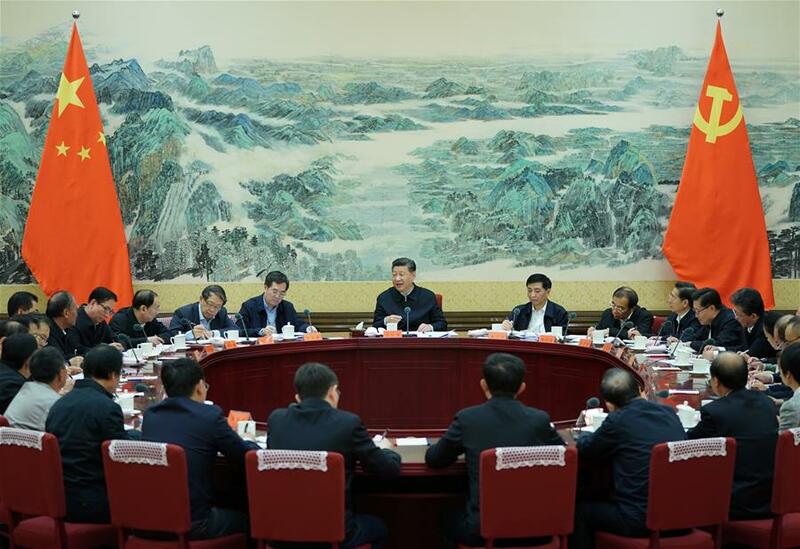 Xi, also Chinese president and chairman of the Central Military Commission, made the remarks during a talk with the new leadership of the All-China Federation of Trade Unions (ACFTU). The Workers' movement is an important part of the cause of the Party, while trade unions' work is a regular and fundamental job for the Party's governance, Xi said. He urged upholding Party leadership over trade unions' work, mobilizing hundreds of millions of workers to make accomplishments in the new era, strengthening ideological and political guidance for employees, and advancing reforms and innovations in trade unions' work. He told the ACFTU leadership to be brave to shoulder responsibilities, be enterprising and active, and make solid efforts to break new ground in the cause of workers' movement and trade unions' work in the new era. Commenting on the work of the ACFTU and trade unions at all levels in the past five years, Xi said they made a lot of productive efforts in strengthening political guidance for workers, organizing employees' work, protecting workers' rights and interests, keeping the team of employees stable, deepening trade union reforms and innovations, and advancing Party building in the trade union system. Trade unions should be loyal to the Party's cause and put the principle of upholding Party leadership and the Chinese socialist system into the practice of workers, Xi said. They should align the firm implementation of the Party's will with effective efforts to serve the workers, he said. He encouraged the country's workers to devote themselves to their jobs, strive for excellence, and make unremitting efforts to create a happy life and a bright future. It is the political responsibility of trade unions to guide employees and the people in following the Party, and consolidate the class foundation and public support for the Party's governance, Xi said. Although the times have changed, the work method of coming from the people and going to the people should not be changed, he said. Trade unions should adapt to new situations and new tasks, he said. They should improve and strengthen ideological and political work for workers, and make more efforts to inspire the country's workers to embrace shared ideals, convictions, values and moral standards, Xi said. Trade unions should adhere to the employee-centered working approach; focus on the most pressing, most immediate issues that concern the employees the most; and fulfill the obligation of safeguarding workers' rights and interests and sincerely serving workers and the people, Xi said. As the reform of trade unions is an important component of deepening overall reform, trade unions should meet the new requirements on reforming people's organizations and create a working system of extensive connection to serve the workers, Xi said. Party committees and governments at all levels must implement the Party's principle of wholeheartedly relying on the working class, and ensure the status of the working class as the master, Xi said. The country should also improve and strengthen the Party's leadership on the work of trade unions, move to resolve major problems in the work of those unions, build a quality and professional team of trade union cadres, and support the creative work of trade unions in accordance with laws and regulations, he added.